Summer seems to temper our tastebuds for a crunchier start to the mornings with granola rotated onto our breakfast schedule. This Macadamia and Wattleseed recipe was inspired by the wattles that colour our morning walks to the studio. Their foliage slowly transforming our path over the year. Their new leaves sprout in the most delicate light silver greens, golden pom poms blossom forth in the Spring and once finished these are replaced by light maroon seed pods. Dangling from the branches over the summer months, these pods fade and crispen, falling to the ground to form a crunchy carpet underneath our shoes. Caring not for the dried filler fruit usually found in granola, this recipe excludes any and leaves your breakfast bowl free to be topped with the sweetness from fresh fruit and berries instead. The roasted wattleseed adds decadent but delicate chocolate, hazelnut and coffee flavours and when combined with the buttery richness of macadamias you may feel like you are eating a luxurious native breakfast made from the Australian bush which has been toasted under the outback summer sun. On a low heat setting in a shallow pan melt the coconut oil and mix in the salt and vanilla extract and honey. Whisk until all ingredients are well incorporated. Bake in the oven for 20min then using a wooden spoon stir through the granola so that the mix has been roughed up and flipped evenly. Put back into the oven for another 20 min, taking it out to stir through again, repeat this one more times or until you can see that the granola is lovely and toasted. Our batch took 50min to toast evenly. 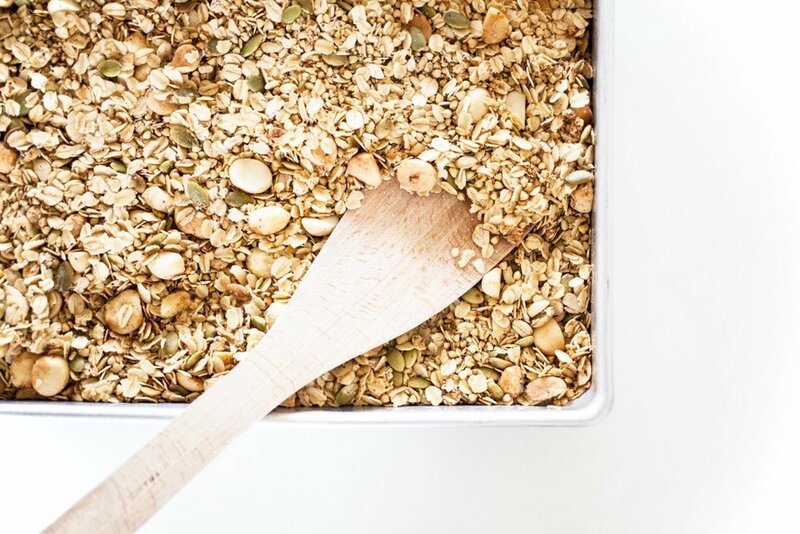 When toasted all the way through, take the granola out of the oven and either place the tray on a cooling rack or tip granola out onto another cool baking tray and allow to cool right through. Have some left over wattleseed? Why not bake some of Mark's Salted Wattleseed and Orange cookies?